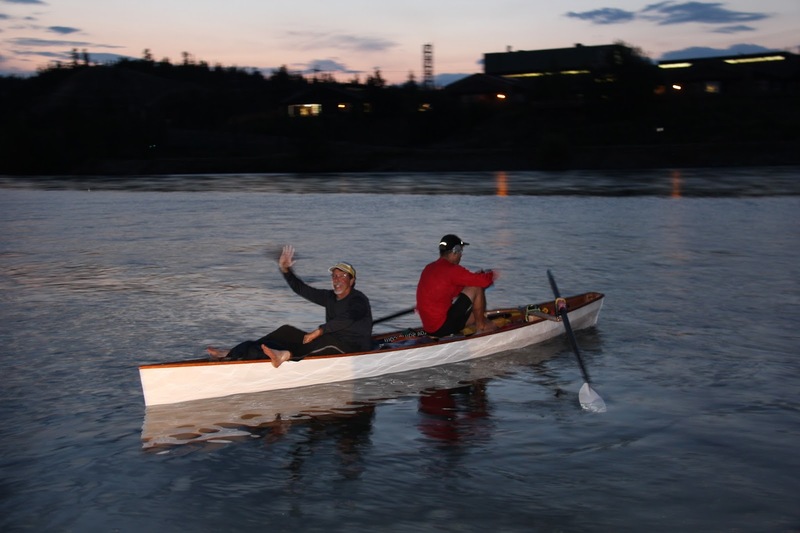 On June 29th, 2013 at 4:55 AM Steve Price and Colin Angus completed their quest to voyage the Yukon River from Whitehorse to Dawson City. Their total elapsed time to cover this 715 km stretch was just over two days at 50 hours and 50 minutes. They set the record for the fastest unsupported journey from Whitehorse to Dawson City and the fastest non-stop voyage, but just missed breaking the overall human-powered record (held by a six-person racing canoe with a time of 49:32). Speed quests are measured by tallying total elapsed time from start to end including rest or repair breaks. 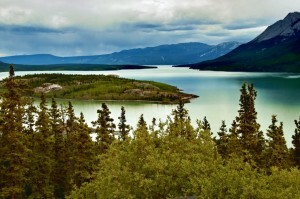 The previous records were set on the Yukon River Quest, a paddle race that is held every year. Colin and Steve’s quest was not connected to the Yukon River Quest, which is limited to kayaks and canoes. Steve and Colin rowed continuously for 50 hours and 50 minutes without stepping ashore. The rowing was completed in two-hour shifts, one person at the oars while the other rested, relaxing on a Thermarest, eating, sleeping and drinking. They used a sixteen foot Oxford Wherry, a vessel Colin designed and built. Its performance and weight is similar to a Kevlar racing canoe, however, it incorporates elements of traditional rowing boats for aesthetics. For propulsion, they utilized a sliding seat rowing system and carbon fiber oars. While the boat offers similar performance to a racing canoe, the propulsion system (sliding seat rowing) is more powerful than paddling allowing it to go significantly faster (assuming cargo, passenger weight, etc are the same). This two person system is unique in small boats (it is used in larger offshore rowing boats), but is one of the most effective ways to maintain speed over long distances. On flat water without current one can sustain a continuous speed of between 7-8 km/hr – for one day or one month. For shorter distances this system would be a disadvantage as it would be more efficient for both crew to be rowing together – faster but unsustainable. If they were competing in a race such as the Yukon River Quest where periodic rest breaks are incorporated, their strategy would be to row in tandem giving them a speed about 30% faster relative to the water. 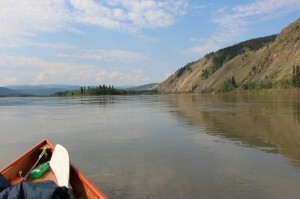 The approximate two days to voyage from Whitehorse to Dawson city is just long enough to allow the two-person alternating rowing system to be advantageous and provide an edge over continuous dual paddling/rowing. While rowing offers better speeds than other paddle craft, the main disadvantage is the rear vantage. An important element for success is reading the river currents effectively and using them to your advantage. Continuous forward visibility is a huge advantage in interpreting the subtle clues offered by the river. Colin and Steve departed from Whitehorse at 2:03 AM so they would reach the infamous 48 km-long Lake Laberge in the early morning hours, historically the calmest time. Unfortunately, they received the strongest winds of the day and more than one and a half hours were lost on Lake Laberge due to heavy headwinds. At one point so much water was coming into the boat from waves that they could only just keep up with the bailing. The infamous Five Finger Rapids posed no problem for the boat. They passed through these turbulent waters at five AM, and while they weren’t concerned about capsizing they were worried about getting soaked and further chilled than they already were. Nine years ago Colin passed through these same rapids in a canoe and was thoroughly drenched by the standing waves. Fortunately, oars offer infinitely more control and power than a paddle, and they were able to delicately thread the boat through the rapids avoiding the larger waves and staying dry. Steve and Colin arrived in Dawson City at 4:55 AM. They were tired but in good physical shape, and felt they would have no problem maintaining their routine for another month. The boat performed flawlessly – tracking well through the turbulent waters and providing ample stability – and no repairs or adjustments were required for the duration of their quest. 1. Fastest time posted in the last 5 years. In the 2013 race, the next fastest time (set by a 6-person canoe) was almost 5 hours slower. 2. Fourth fastest time in history. 3. Second fastest time in history for a two-person team. 4. Faster than any time posted by a two-person canoe. 6. Fastest unsupported journey from Whitehorse to Dawson City (meaning that, unlike the Yukon River Quest contestants, they were provided with no food, shelter, or water along the way). 7. And finally, they are the only recorded team that has ever made the voyage between Whitehorse and Dawson City without once stepping ashore.